Single domestic registered rate of 5 candarins. From the collection of major James Starr. Single domestic letter rate of 3 candarins. 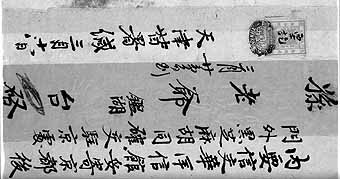 This is a very rare example of the Imperial Customs Post conveying a letter between the Hwa-Yang Letter Offices in Tientsin and Peking. No other cover has yet been recorded with either the oval or 'dragon' cachets in blue. For a detailed history of the 'Hwa-Yang' we would refer to Chapter VII of the handbook 'Imperial China' by Major Richard Pratt FRPSL.